The time we all start thinking about getting organised for the new year. The time we start browsing through the shops and online for a planner or diary that will help us on that journey to getting organised for 2015. The time I get to post all of my diary and planner favourites to help make your choosing much easier! It's simple, beautiful and full of inspiration. Available online here. It's bright & happy and has four simple, purposeful spaces: Today (7am-7pm schedule), To-do, Notes and Dinner. Perfect for organising but not overwhelming. Available here (but selling out fast - I looked at 5 other online stores before I found one with any left). Almost everyone I know who has tried an Erin Condren planner has LOVED their Erin Condren planner. I used one a couple of years ago and it was beautiful and kept me really organised. And this one with the believe quote - I could look at it all day. Available here. This is more than your regular diary - it includes to do list, people to call, menu and exercise planning, Public and school holidays (AU & NZ), plus an event section to make organising holidays and entertaining easy. Available here. Very cute designs from Typo this year! These diaries have a daily layout, personal information, public holidays and reference calendar inside, ribbon bookmark, elastic closure, printed tabs for each month, pocket for your notes on the internal back cover. Available here. Ooh this one's full of inspiration, seasonal recipes and move challenges so if you're looking to have a healthy 2015 it looks like the MNB diary has you covered. Available here. This one is a gorgeous week by week diary. Looks like it's designed for the UK and it's packed full of country facts and seasonal ideas for the whole year and beautifully illustrated. Available here. The sturdy hardback diary runs for the whole year. It also includes their name on the front and the message of your choice on the back, both expertly printed and incorporated into the design. It's a fantastic luxury gift that’s unique to the recipient. Choose between slim or large sizes. Available here. This one has space for up to 5 schedules, plus useful birthday reminders, festive planners and handy pockets for important stuff. Available here. 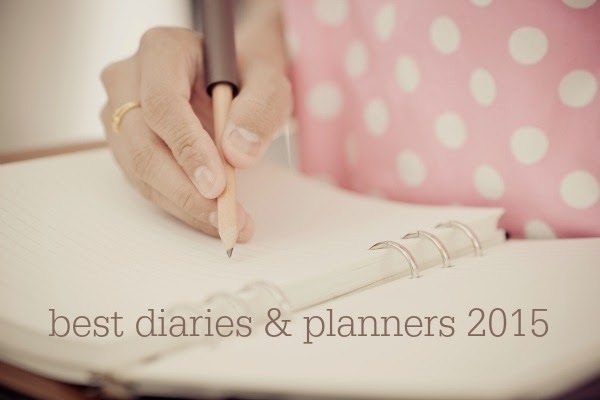 So those are my favourite diaries and planners for 2015!